Urgent! We need 500 names on a petition to save the Sanborn … by midnight! A petition to save the former ASPIRA building in Bridgeport's West End needs 500 signatures before midnight. As of 2:40 p.m. today (Friday, Aug. 31), supporters of the beautiful Sanborn Library are 158 signatures short. We can do it. Sign the petition and share the news on social media. 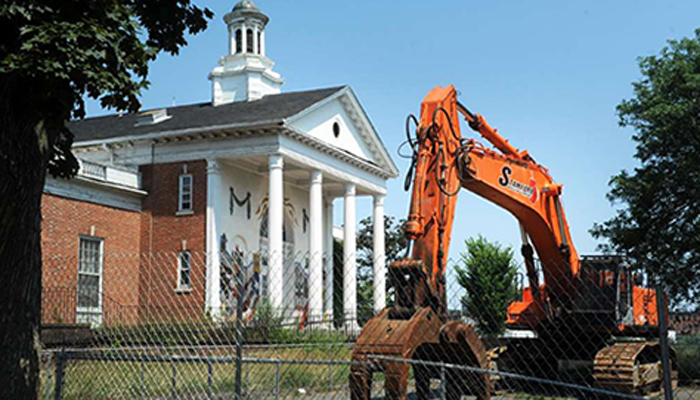 The petition demonstrates the public's resolve to stop the bulldozer from tearing down this landmark building, situated where State Street and Fairfield Avenue meet. If the Sanborn Library building goes, down, so does its contemporary mural, which is a significant symbol to many in the Latino community and especially Puerto Ricans. Now privately owned, the Sanborn Library building has marked a western gateway to the heart of downtown Bridgeport for nearly 100 years. This “jewel box in the park” is the award-winning design of famed Bridgeport architect, Leonard Asheim, who also designed the Klein Memorial Auditorium, and Achavath Achim Synagogue and the Good Shepherd Church on Hancock Street, which is listed in the national register of historic places. Click here to see and sign the petition!